The Sunshine Coast has recorded another strong increase in international arrivals with 8.2% growth to 294,000 in the year to September 2017, but alarmingly, visitor expenditure declined 11.9% to $235.6 million. Statistics released by Tourism Research Australia in the latest International Visitor Survey (IVS) showed that the Sunshine Coast international visitor growth (8.2%) topped the Australian growth figure (7.1%) and was higher than the overall Queensland State (3%) – as well as individual destinations such as Gold Coast (4.2%), Brisbane (4.6%) and TNQ (1.5%) – but a reduction in holiday travellers, shorter visits, and an increase in stays in unregulated premises meant that visitor expenditure on the Sunshine Coast wasn’t keeping pace with arrivals. Visit Sunshine Coast CEO Simon Latchford said the impressive growth in visitor arrivals from Europe was a direct result of the major marketing campaigns in Europe at the start of the year, with increases recorded despite falls in the Euro and Pound against the Australian dollar since the start of 2016. “On the surface, Sunshine Coast’s tourism industry has a lot to celebrate with these figures, but the significant decline in expenditure and the reduction in stays reflect an aspect of our industry that has been a major problem for some time, and getting more serious: the constraint caused by the lack of new 5-star accommodation along the Coast,” he said. “The last 5-star hotel to be developed was the Hyatt Coolum, over 30 years ago. Its closure has had a major negative impact on the Sunshine Coast’s ability to attract high-level leisure and conference business. That premium sector of the market is now being courted by destinations up and down the east coast because they can offer outstanding new accommodation and conference venues. Visit Sunshine Coast Chair, David Ryan, said that it was important to encourage new sensitive and appropriate 5-star hotel and resort development. “There have been three serious proposals for new 5-star developments on the Sunshine Coast over the past few years,” said Mr Ryan. “They have been through rigorous planning regimes and in some cases made substantial modifications as a result of community feedback, but we are no nearer to one of them commencing building. “The redeveloped airport will open in 2020, and has the potential to change the face of Sunshine Coast tourism for decades to come. That leaves just over two years to get major new accommodation infrastructure developed, so it is imperative that there is positive action taken to expedite these projects. 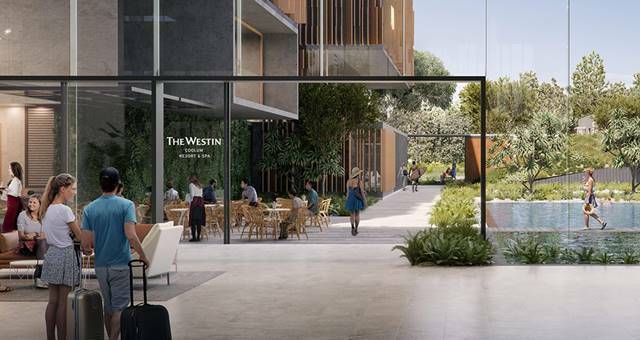 “The rest of Australia is going through a hotel development renaissance with places like the Gold Coast and Brisbane each having a comprehensive range of new upscale hotels in the pipeline. Unless there is a more positive and collegiate attitude to new development on the Sunshine Coast, the huge investment opportunities will pass us by and it is uncertain whether they will come back again for quite some time. “No one is saying that there should be ‘development at any cost’. We have been very clear that any hotel development must be sympathetic to the local environment, which is why we have been encouraged by some pioneering environmental and community components that have been included in the resort proposals.